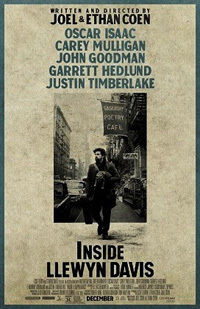 Llewyn Davis is a struggling folk musician in 1961 New York. Broke, crashing on friends’ couches, playing the same venues and taking the odd session recording gig, he is not content with his situation and the state of the music scene - success slipping from his grasp, but his headstrong vision in tact. Absurd situations like Llewyn stuck looking after a cat he accidentally let out of a friends’ apartment adds to that signature quirkiness of the Coens – the cat also going along on a trip to Chicago where he tries his luck at a big venue. All these little experiences and encounters with friends, acquaintances and strangers feels like an aimless rambling of a man heading nowhere, but with a talent that can connect – yet resulting in him being his own worst enemy. As with the Coens’ classic movie Fargo, the cold winter weather also plays a part here, the bleakness adding to Llewyn’s despondent disposition. Another staple of theirs is the injection of unique, amusing and strange supporting characters around their flawed leads. This film won the 2013 Cannes Grand Prix award and as usual features T. Bone Burnett as executive music producer. Not my favourite Coen movie, but a must for fans.